Welcome to Knowledge Base. You will find here a rich source of knowledge and wisdom relating to Box Blight, Topbuxus products and other topical issues and news that folk are asking about. Click the button below and reach out with your question or query. We’ll be very glad to help. Feel free to comment or reply to any posts if you feel you can make a contribution. Attach Image (Allowed file types: jpg, gif, png, maximum file size: 10MB. Does this product contain any insecticide? Topbuxus Healthmix is not an insecticide. 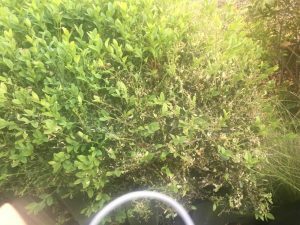 Can I use Topbuxus on my sarcococca (sweet box)? It seems a shame to waste the mixture left over from spraying 2 box balls! Thanks for your question – we are often asked this. Topbuxus Healthmix has been specifically produced for treating Box plants, so we can’t guarantee it will help your Sarcococca but I doubt it will do them any damage if you wanted to try. Hi, could you expand on the reasoning for the warning not to spray when the temp is above 25 degrees. Is the concern leaf scorch from the wet leaves or is it about jolting the plant into new growth when the plant is stressed in hot weather for example? Obviously we are suffering temps nearer 30 in this heat wave and I am wondering if it would be safe to spray late evening around 8-9pm out of direct sunlight when it might still be 27/28 degrees? Thanks for your very relevant question! You have hit the nail on the head with your answers. Leaf scorch and forced growth at a stressful time is exactly why we recommend not to spray Topbuxus Healthmix in very hot temperatures. However, if your plants are actually suffering from Box Blight we would suggest you go ahead and spray them anyway – but as you say, late evening is the best time as it should be mostly dry by morning. If you are simply spraying healthy plants as part of your regular maintenance and Blight prevention program then we would suggest you wait until the weather breaks before applying again. Trust that helps a little. Hello , Is it ok to use a mix of Top Buxus that was left over from last season or should I throw it away ? Sue, If the Healthmix from last season is pre-mixed in liquid form I suggest you do dispose of it. But if it’s still in tablets in the wrappers it will be fine to use. 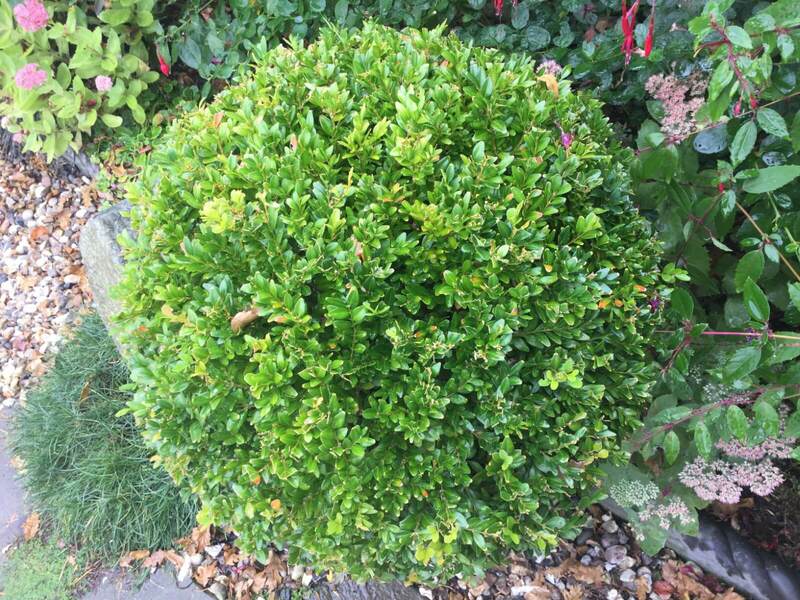 I have just purchased some Topbuxus Health-Mix but my hedges need trimming. Should I apply the mix before or after trimming? I would suggest you spray after trimming as this will help prevent any ingression of the disease through the freshly cut foliage. Good luck! I am another buyer of TopBuxus from Amazon and would appreciate any instructions in addition to the icons on the container. Some yellow patches on my box, and uneven new growth on last year’s transplants. Anne, Here’s a link to the information page on Topbuxus Healthmix where you can see how to use the product. Above is the ‘How To Use’ leaflet. When is the best time of year to apply the treatment if Box Blight is suspected? Many thanks. Viv, If Box Blight is suspected we would recommend Topbuxus Healthmix is applied at the earliest opportunity – whatever the time of year. During winter months visual improvement from using Topbuxus Healthmix will be minimal but you will still be dealing with the source of the problem giving the your plants the best chance of recovering fully in the spring. I have just transplanted some 40cm box balls into containers using Rootgrow mycorrhizal fungi granules around the roots to hopefully get them off to a good start. 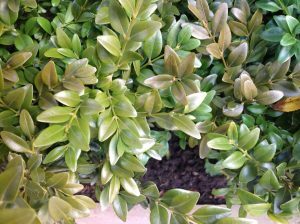 Do I have to wait before using Topbuxus Health Mix on the foliage? Catriona, I’m pleased your’re using Rootgrow – we’ve had some excellent results with this ourselves. There would be no issues with using Topbuxus Health Mix straight away. I bought a tub of Topbuxus Xentari from Amazon. The instructions are in German. Any chance of some English instructions? Alan, we do have them in English. I’ll email them through to you very shortly. Thanks. Look forward to receiving them. Anytime! They should be with you now. Thanks; have received them and I’ll make a start when the garden dries out. I, too, would love some English instructions, having just bought some Xentari. No problem Simon! I have posted them on Knowledge Base – see above. I am attaching a few images of my buxus hedge. This discolouration is occurring at various points along the hedge. It was last treated with Topbuxus Health Mix about 6 weeks ago. Not sure what the problem is and what I need to do. Sue, I do not think your plants are suffering from Blight. However as you point out they are not in great condition and this does leave the door open for disease. There are several potential reasons for discolouration like this – probably the most common is lack of water. I have some box at home in a very dry spot and they look similar to your plants. We have also seen plants around the edge of patios mysteriously die or be continuously in poor condition and on investigation it has turned out that the owners were washing down the patio with detergent to the detriment of their plants. Poor quality soil would also cause these symptoms and I would suggest you apply some slow release fertilizer and continue to feed them with Topbuxus Health Mix at regular intervals of about 5 weeks throughout the growing season. I also notice some small white marks on the leaves which indicate the presence of Boxwood spider mites (Eurytetranychus buxi) – these would also impact on the general health of your plants and I would suggest you deal with these creatures. 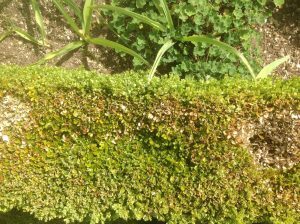 Here’s a link to further info on Boxwood Spider Mites and treatments for the problem. A rather longwinded reply! But hopefully that helps a little. Many thanks for your advice Jack – will get to work on this. I am about to spray my box hedge with Bug Clear Ultra as I have an infestation of box caterpillar. Before this, I was thinking of using Health-Mix as I think I also have a case of blight. Can I use the sprays together? If so, which should I use first and how much time should I leave before spraying each? Thank you very much. Frances, as far we’re aware there are no detrimental effects from spraying Topbuxus Healthmix along with other sprays. I would suggest you spray the caterpillars first then perhaps leave it a day or so before spraying with Topbuxus Healthmix otherwise if you spray too close together you may simply wash the previous spray away. Thank you so much for your prompt reply and advice. I have just placed an order for Healthmix and will use it after hopefully getting rid of the caterpillar infestation. 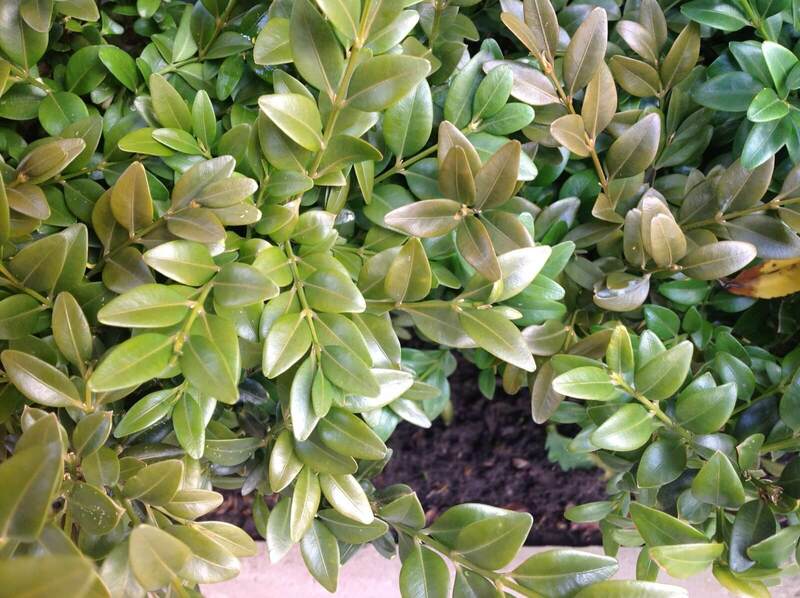 Do you supply Topbuxus Xentari? Brian, Topbuxus Xentari has not yet been officially approved for sale in the UK so we are unable to supply at the moment. However, it is available in quite a few Continental countries and I believe it can be purchased via Amazon in the UK. 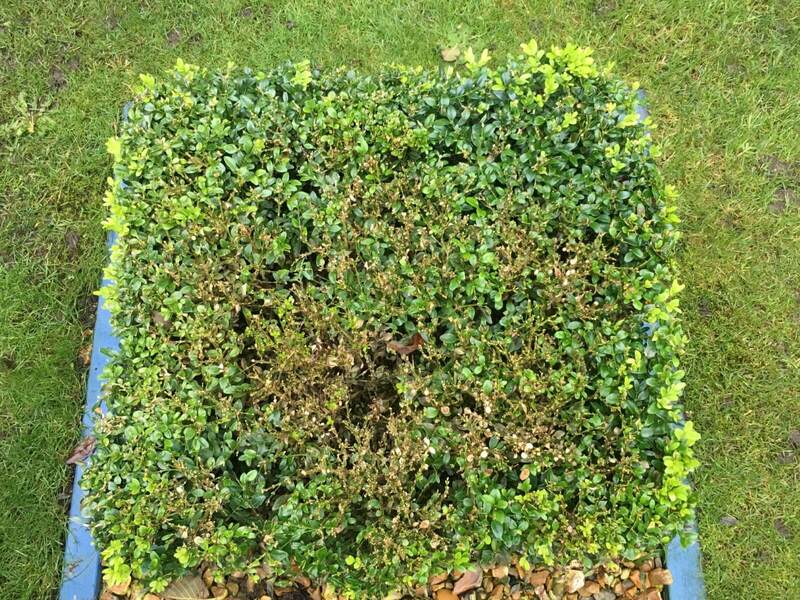 My small box hedge has become ‘dead’ looking with brown or no leaves at all. It is quite sticky to the touch and it had happened relatively quickly. Is it too late, or shall I dig it out?? Antoinette, I’m sorry to hear about your hedge! Please could you send me some photos? info@topbuxus.co.uk (or post them here.) 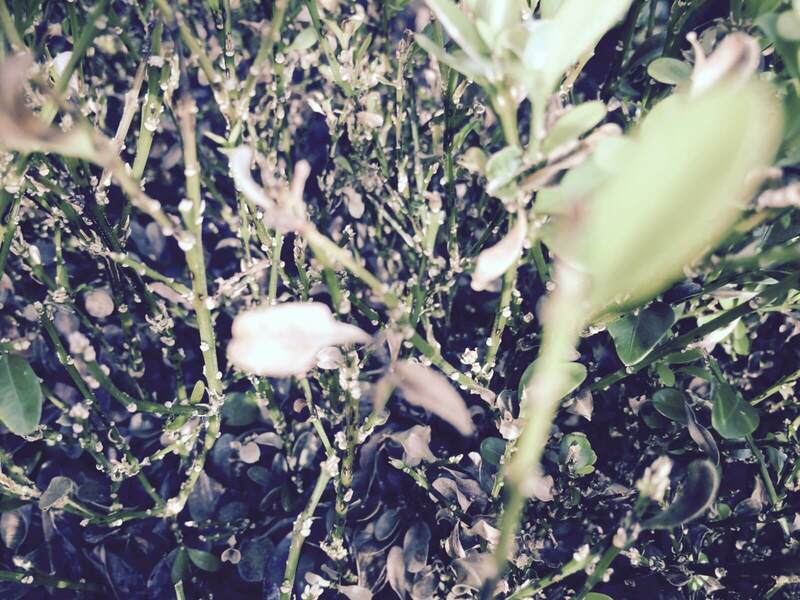 It sounds like Boxwood Moth damage to me but photos would help clarify this and I could then reply in more detail. Thanks for emailing the photos. It looks very much like your plants have an infestation of Box Tree Moth (Cydalima Perspectalis). The good news is that this problem does not usually kill the plants – the leaves will normally regrow. But you do need to treat the caterpillars with insecticide. We do not currently have a product available in the UK to control Box Tree Moth but there are effective insecticides available that should easily control the issue. Thank you for your help. Shall get some insecticide and see what happens. 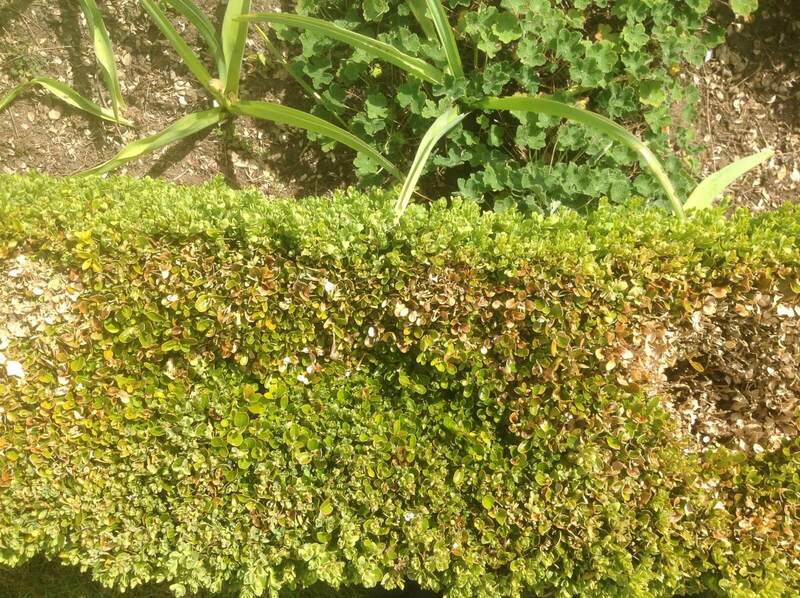 Advice on rejuvenating large parterre hit by box blight. Can we use Topbuxus more often and should we cut down unaffected plants as well? Sue, you will not cause any damage if you use Topbuxus Health Mix more often than recommended. Indeed, in the early stages of treatment the heavier the dose and more often you spray the more likely you are to kill all remaining fungal spores and save the plants. Blight can in time actually kill the plants but often they will defoliate whilst the branches and twigs still have life in them. Unless the plants are actually dead I would not recommend you cut any of it down (affected or unaffected) as we have had reports from our customers of Box plants recovering from almost complete defoliation and it seems a shame to start again from scratch when the structure is already there. 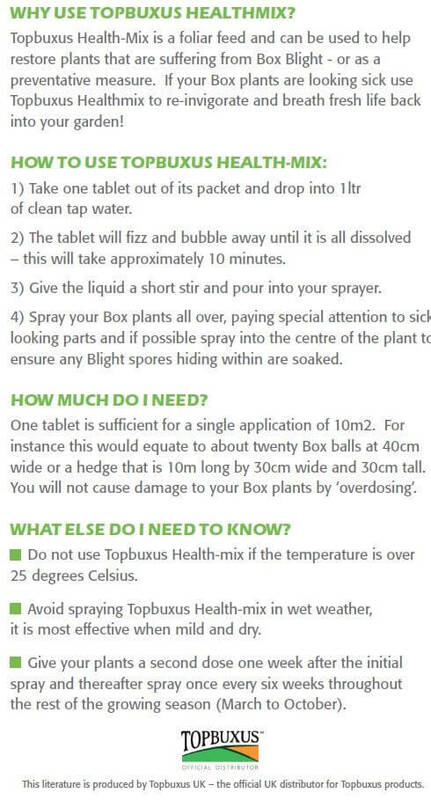 I ordered some Topbuxus Healthmix and a sprayer from you yesterday – so I will follow the instructions and cross my fingers. Out of interest, these were new box balls planted just last week. Should I go complain? Or is Box Blight just a fact of gardening life and something I risked when I ordered them? Thanks again for your help. Antony, I feel confident your plants will soon be looking a lot better. In fairness to your supplier the spread of Box Blight is very difficult to control and I don’t think many wholesalers now will offer any guarantee against the disease. It has become much more of an excepted part of gardening and is simply something we need to be prepared for, much like we expect to treat Roses for ‘Black Spot’. Prevention is key – we believe healthy plants will not be as likely to contract the disease. Thanks so much for all this. One final question – my last I promise! I have before me my new sprayer filled with Topbuxus Healthmix. I also have a sprayer containing Bayer’s Fungicide Plus. I go on holiday for a week tomorrow, leaving 3 am. Which do I spray onto my precious new box balls for this first treatment? i.e. which is more urgently required to combat the early signs of box blight? Or, conceivably, can I spray on both? I really do promise not to pester you again (at least not for a long time) after this. Thank you so much for your wise counsel. You are welcome anytime! I don’t personally have experience with Bayer’s Fungicide Plus. Topbuxus Health mix should be applied at the earliest possible opportunity once your plants have symptoms of the disease. As far as we are aware Topbuxus Health Mix can be used along with any other spray. However, if the Bayer product is also a spray I would leave it a few hours to dry before applying or the Health Mix be washed off. Thanks so much for your help. Will keep you posted. Hi, I live in France but I don’t think that will make any difference and I would prefer the answer in English!! I don’t have blight (yet!) but we do have the caterpillar (lots). I have successfully treated the caterpillars which hatched after overwintering with bacillus thuringiensis. The male moths appeared in my pheromone traps about a month ago and I have been ‘on the lookout’ for the next lot of caterpillars ever since. I have just been doing a routine spray with Topbuxus and found the first tiny caterpillars. Do I need to wait for any specific length of time before I spray with BT after spraying with your product? Liz, as far as we are aware Topbuxus Healthmix can be safely sprayed on the plants along with any other insecticide or spray. 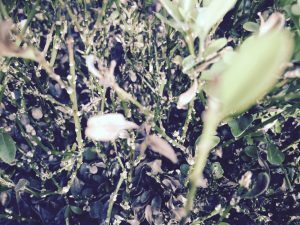 However, spraying very soon after you’ve just applied Topbuxus Healthmix may tend wash of some of the Healthmix – but I would suggest that your top priority right now is to deal with the young caterpillars so I wouldn’t let that hold you up. I trust this answers your query but if I’ve missed your point or you have further questions, please do let us know. You haven’t missed the point at all! If only someone would develop a systemic solution fit for amateurs! It’s terrible round here and tragic as many of the deciduous woodland has a lot of wild box. I should have said too that the Topbuxus Healthmix is great, thank you. Good – glad to help. I’m sorry your plants have got the dreaded Blight – it’s horrible how quickly it appears and spreads! The warm, damp weather we’ve had are perfect breeding conditions for Blight. I think you will start to see results quite soon. However, your plants may continue to look worse before they get better as any leaves that are infected are likely to shrivel and drop off – so you will need to wait for the new growth to kick in before you see a real difference. Hope that helps a little but do let me know if you have any further questions. Please help. Is this Blight? Jennifer, I am convinced that your plants are not suffering from Box Blight. The partly eaten leaves indicate damage from the Box Tree Caterpillar (Cydalima perspectalis) – most likely this happened during last summer and possibly this spring as well. Topbuxus Healthmix does not deal with this problem unfortunately but I believe that there are effective treatments available. However, there does seem to be some healthy looking re-growth appearing on your plants. Thank you, Jack. This helps a lot just being able to identify what the problem is. Many thanks for your advice. Is the product you are selling this year the same as the one you were selling before. I thought your last product was call Top Buxus? Sarah, Topbuxus is the ‘umbrella’ brand name for quite a few products – but Topbuxus ‘Health Mix’ is the one that helps prevent Box Blight. Our UK website is set up specifically to sell just Topbuxus Healthmix at the moment. Thanks so much for the swift response. Will order now! 3 plants in pots… 1 ball shaped, 2 triangle. Had them since small now fairly large. Some leaves looked a bit brown in April so re-potted and trimmed brown leaves out. Started to green-up. Saw your product on Amazon. Not much advice after preparation for the novice. I am a non-professional gardener. I was unsure, does solution have to be used straightaway or does it keep… if yes for how long. Used spray up in one go. Now trees look very coppery brown over the surface. Have I done harm by using too much spray? Deborah, I’m sorry your plants are looking sick. It sounds like you’ve done the right thing to re-pot them (hopefully with fresh new compost) as this would normally give the plants quite a boost. You won’t damage them by an overdose of Healthmix but I’m surprised that they are not showing healthy signs yet. The mixture could be kept for a while but if it becomes lumpy or solidifies in any way I suggest you dispose of it as it will likely block your sprayer. If you could possibly send photos that would help us to identify the problem. Thanks for emailing the photos through. Your plants do certainly have the appearance of blight in varying stages but I would say some of the containers look a little small for the size plants you have. Now this may not have a direct link to your blight problems but if a plant is weak through lack of nutrients they will be much more susceptible to disease. However, if you feel your plants do have sufficient space in their new pots and you have used quality compost I expect you to be getting results from the Topbuxus Health Mix quite soon. Good luck – and do let me know if you have any more queries. Not yet. But we’re on the case and soon hope to have distributers in the USA! Our 4 box plants affected with Box Blight were moved earlier this year and up until about 4 weeks ago were showing fresh growth. I have treated with health mix this week and will treat again next week. I was wondering whether I should cut them back and then treat or leave as is. The other box in the garden looks healthy and I have also treated this. Jayne, I suggest you treat first and then cut back a week/ten days later. If you spray before cutting back there is more surface area available for the spray to settle on and it is therefore more likely to produce good results. You’ve done the right thing in spraying the other healthy box in your garden – Topbuxus Healthmix is also a preventative as well as dealing with the actual problem. Hi there, I am a professional gardener my clients gardens range from an acre upwards most with box . One particular clients box was in a really sad state, after 3 applications of the health mix well with are both amazed. Thank you for this amazing transformation. I work as a Head Gardener at a large estate. We have used Topbuxus previously but have been asked to go 100% organic. Is Topbuxus an organic fertilizer? It is hard to ascertain from the website. Tim, Topbuxus Healthmix is not certified organic but it is a based on natural material – Copper being the active ingredient. I trust that helps but do message me if you have any other queries. We have 3 small box balls in terracotta pots that are currently perfectly healthy but we intend to use Buxus health mix as a preventative treatment against potential blight. Due to the small quantity of mix that will be used, can the tablets cut into half or quarters? Alternatively can the mix be kept for further spraying? Many thanks. Ken, I see no harm in dividing a tablet but you may find it crumbles a bit. The main thing will be to keep the remainder in a completely water-tight container because the granules will react as soon as it comes into contact with any moisture. Or it it’s easier it would be fine to keep the remaining mixture for a couple of weeks – although I guess it will need stirring or shaking when you come to use it again. If the mixture becomes ‘lumpy’ or solidifies in any way over time I would advise you throw it away as it is likely to block your sprayer nozzle. Many thanks for this useful information. Now waiting for the right weather conditions before applying! I have recently received from you a box of Buxus Health Mix. I note that the solution should not be applied if the temperature is over 25 degrees Celsius. However, I assume that it is alright to spray in bright sunshine given that the temperature is not too high. Please would you kindly confirm? Thanking you. Anne, Yes it is fine to spray in bright sunshine – just avoid applying if the temperature approaches 25 degrees. Thank you for your reply which is helpful. No problem at all – glad to help. Do I apply Topbuxus Healthmix to the leaves or around the base of the plant? Can I plant new Box Plants in the same ground which has previously contained plants affected with Box Blight? Brian, You could plant replacements in the same area but there would be a risk of them picking up the infection from fungal spores left in the ground or on old dead leaves. The risk would be significantly reduced by drenching the area with Topbuxus Healthmix before you install the new plants. It would also be further reduced by including Topbuxus Healthmix in your regular maintenance programme as a preventive measure. Check our page on Box Blight for more preventative tips. Jack – Is this blight? Please advise. Penny, I’m afraid the condition of your Box hedge does indicate Blight in the middle/late stages. However I believe it is not too late and could be effectively dealt with and stopped from spreading. Click on the link below if you are not sure how much Topbuxus Healthmix you’re going to need. Thanks very much for your prompt and very efficient reply Jack. The hedging is part of a fairly extensive topiary garden – about 100 metres in total. Approx 50% is affected. I’m keen to purchase the Health Mix and try it out but wonder whether you do it in more economical sized containers? Glad to help Penny. 100 tablet tubs is the largest size we offer at the moment. I’m in the process of planting my Buxus hedge – I need to know when do I start using the Topbuxus tablets you sell for the hedge after I have planted it? Hardi, Spraying once every 6 weeks throughout the rest of the growing season (March-Oct) is normally enough to keep your plants healthy and Blight free. As well as a preventing Blight, Healthmix is also a growth stimulant and will give them a good start in life. After I have mixed my tablet with 1L of water and I do not use it all, can I leave the remaining mixture in a closed container for later use? Richard, you should be fine to keep the remaining mixture for a couple of weeks – although I guess it will need stirring or shaking when you come to use it again. I have been using Bayer fungus fighter concentrate as a preventative against blight for the last 2 years, spraying 5 times a year. I have just bought Topbuxus Healthmix. Can I use both products on my box. 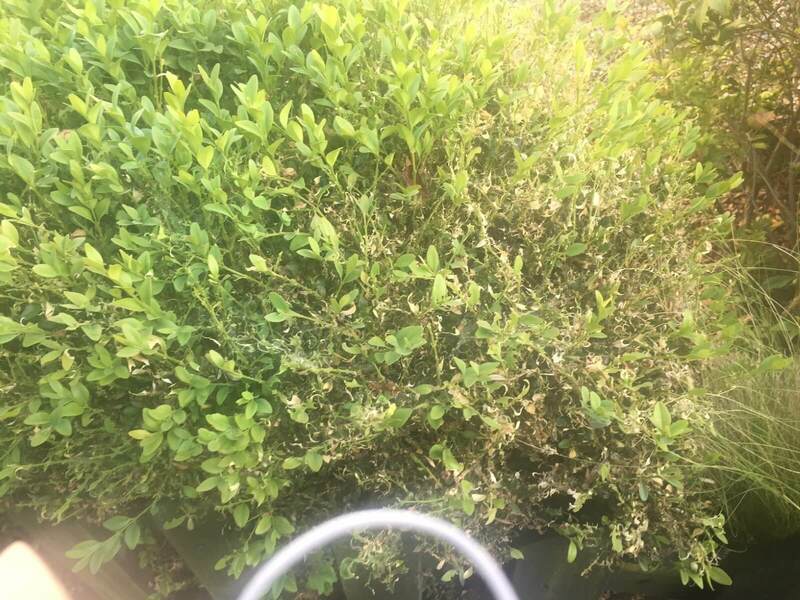 Shirley, Topbuxus Healthmix should not be tank mixed with other sprays but it is unlikely that there would be any detrimental effect if other chemicals were sprayed on plants treated with Topbuxus as long as there was an interval of several days between sprays. Hi…please can you help me with my poor box spirals. They are approx 2′ wide x 4′ high, very fat and dense and growing in large pots. Last summer one started a brown patch on one side half way up, about 6″ round, lost those leaves and I thought it had been scorched in the sun. Since then the patch has extended down the outside of the plant and is now about 2’6″ long. The outside leaves brown and fall off, the stems stay green and some small new leaves try to form. The leaves further in stay green and the affected stems stick out about 4″ with the odd new leaf attached. These plants were beautiful and very dense so I am anxious to try to stop this condition getting worse. Many thanks in advance and hoping you can help me solve this. Larraine, I’m sorry to hear about your Box Spirals – if you could send me some photos info@topbuxus.co.uk (or post them here) and we’ll do our best to identify the problem for you. We have 4 box balls in a rather dry soil. I was going to dig in some manure and some slow release fertiliser round the base this spring. If I use Topbuxus should I still apply the slow release fertiliser? Lisa, I suggest you do use the slow release fertiliser and manure as well as the Topbuxus. Topbuxus is a folia feed (nutrients are absorbed through the leaves) and the fertiliser and manure will stimulate the plant through its roots so you are feeding your plants in two separate ways. You should see some good results! Just a brief word or warning – do be careful how deep you dig the fertiliser and manure in as you don’t want to damage the roots. If it’s a dry spot they’ll need all the roots they can get their hands on! I’d recommend you dig this in as soon as possible before the plants actually start growing too much. Thank you very much, Jack. That is really helpful. Do you think this is Blight? Peter, I’ve studied the photo you’ve sent through and I’m convinced that your plants are not suffering from Box Blight. The partly eaten leaves indicate damage from the Box Tree Caterpillar (Cydalima perspectalis) – most likely this happened during last summer. Topbuxus Healthmix does not deal with this problem unfortunately but I believe that there are effective treatments available. Encouragingly though, there does seem to be some healthy looking re-growth appearing on your plants. I trust this helps but do let me know if you have any further queries. Many thanks for your advice. If in the future we are unlucky enough to encounter Box Blight, we know where to come for treatment now, anyway. Cheers. No problem Peter – glad to help. Hi your product is superb and working wonders with all my box plants. Had full recovery with one suffering with blight. I am a Head gardener on a large estate and have a large collection of box and topiary. Can I mix Horticulture soap with your product? And can I spray this month (March) if the weather is mild? Thanks again for this wonderful product. I can’t endorse it enough! Bernard, thanks very much for your endorsement! I’m glad to know it is working so well for you. 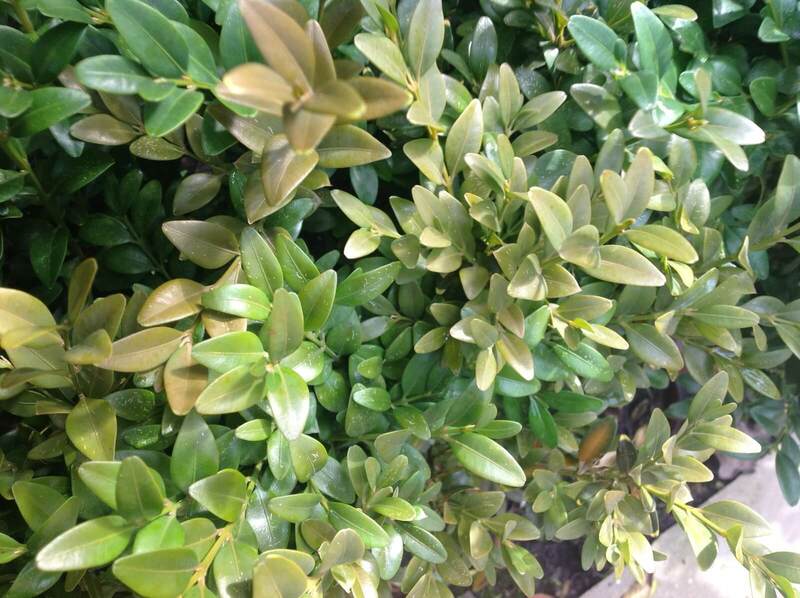 In answer to your question: Topbuxus Healthmix should not be tank mixed with other sprays but it is unlikely that there would be any detrimental effect if other chemicals were sprayed on plants treated with Topbuxus as long as there was an interval of several days between applications. 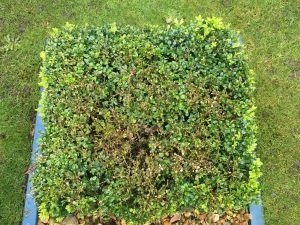 I have been using Topbuxus for several years with great results and now I am considering using this treatment on new garden box topiary. Could you please tell me if Topbuxus Healthmix is organic or not as it is not clear from the description. Thanks. Stephen, Glad to hear about your great results! Topbuxus Healthmix is not certified organic but it is a based on natural material – Copper being the active ingredient. Do you offer your product for sale to retail customers at all, or are you sole suppliers of Topbuxus? I would be interested to use your product (we grow and trade and plant Buxus) and sell Topbuxus to our customers. Do you offer this, or would you consider offering this? Michael, We are indeed set up to supply distributers and work with garden centres and other re-sellers across the UK. I will be in touch via email with distributer prices and more information. Thank you for swift reply, I would just like to ask you one more question and that is if Topbuxus Healthmix is affected by the use of chemical sprays…? Topbuxus Healthmix should not be tank mixed with other a sprays but it is unlikely that there would be any detrimental effect if other chemicals were sprayed on plants treated with Topbuxus as long as there was an interval of several days between applications. Please could you tell me whether the Buxus Health Mix can be used on other evergreen shrubs as a feed. for example Yew? Also can your fertilizer be used for both? Jane, Both Topbuxus Healthmix and the Fertilizer have been specifically developed for Buxus. We have heard by report that our Topbuxus products work on other evergreens but it is not something we promote. This is not because we believe there would be any risk involved but as a company we have to keep focused on what our products real purpose is. Jack, thanks for the information. I will order enough for my box only. Can this product be applied in November to treat Buxus blight or should I wait until the growing season in March? Is there any point in using your Buxus health mix now in November. Especially where the plants have been attacked by Box tree caterpillar? Guy, Topbuxus will still attack Blight now if you use it on an existing infection – although the re-growth benefits may not be realised until spring. Topbuxus does not deal with the Caterpillar problem but it will encourage re-growth from plants that have suffered from caterpillar damage. Please advise on application method? Fergus, 1 tablet makes 1Ltr of spray. You simply drop the tablet/s into the water and it will instantly begin to dissolve. Wait 10 minutes or so before applying the spray with a knapsack or hand sprayer. Give liquid a final stir before spraying. Each tablet is enough for 10m2 of hedge. Give the plants a liberal coating all over and if possible try to get inside the plants as well as often this is where the disease begins. Hope this helps but for more information click https://www.topbuxus.co.uk/product/buxus-health-mix/#use or message me back if you have any further questions. Hi Jack, I will order from your website later today but will the blight be passed onto my other 8 box balls? I am considering removing the infected plant and spraying the others, which at the moment are quite healthy, with your product. Pat, it is likely that your other Box plants are already ‘incubating’ Blight spores, even though they appear healthy. From the photos you sent me earlier I’m confident that you have a good chance of saving all the plants (including the infected one) if you spray them soon. My Box hedges are now badly affected in places. Should I start treatment now or wait till the growing season next year? Mike, I would suggest you start treatment as soon as possible. The disease will continue to infect the plant whether it is growing or not. If you can knock the disease out before next growing season the plant will have a much better chance of survival. Julie, your Box Plant does have the appearance of Blight in the early/middle stages. Although this may be worrying Box Blight caught at this point can still often be effectively dealt with. Our QUANTITY CALCULATOR https://www.topbuxus.co.uk/product/buxus-health-mix/ will help if you are not sure how much Topbuxus Healthmix you might need. That’s great thanks so much, I was advised to remove the plants, so do you think they will still have a chance if I treat them? Please advise who I should contact for an image of Topbuxus – we want to show it in an article to appear in Amateur Gardening magazine. Thanks. What is the toxicity of Topbuxus Healthmix? Is it safe to use by someone untrained in pesticide use? 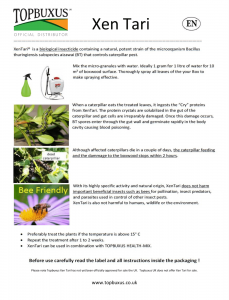 Tom, Topbuxus Healthmix is very simple to use and each tub ordered from http://www.topbuxus.co.uk will come with an instruction leaflet. 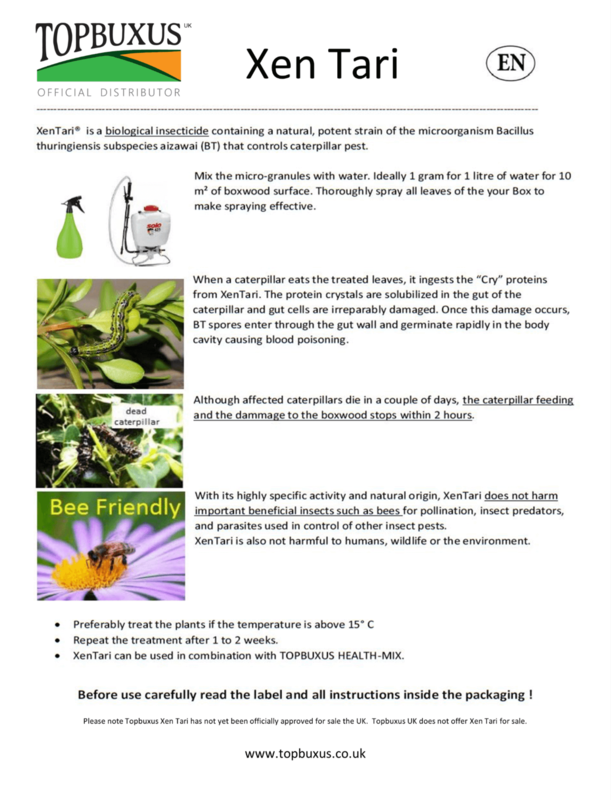 Topbuxus Healthmix meets EC Fertilizer criteria (it is not classified as a pesticide) and for your information I will email you the Safety Data sheet which points up any areas of concern. Hi there do I need to clip off all the bare stems before spraying the hedge with health mix? Sue, I would suggest that you don’t clip off any of the bare branches before spraying. 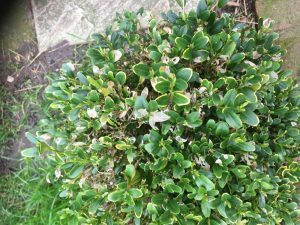 Give time for Topbuxus to start working and you may find some of the bare branches start to re-shoot – it all depends on how far into the plant’s system the Blight has penetrated. Once the plants are showing clear signs of re-growth it will be easy to pick out which bits are actually dead and you can then cut them out. Jack, thank you so much for your reply. I am so pleased I discovered your website, fingers crossed I can save my beautiful knot garden! One more question! The box has dead leaves dropped like confetti everywhere….I am guessing I need to remove them all……from the gravel…..is there an easy way to do this apart from picking them up by hand? If it’s a dry day maybe you could use a vacuum hoover? Otherwise just make sure you spray all the dead leave on the ground as well so that any spores they are hosting are dealt with. Lesley, your Box plants do have the appearance of Box Blight in the middle / late stages. The link below will take you to the quantity calculator which will help you work out how much Topbuxus Healthmix you need. Brian, although your Box ball has some orange leaves I don’t think it is suffering from Blight. The orange leaves are more likely to be die-back from when it was last trimmed. However, the warm, damp conditions at the moment are very conducive to Blight so do keep a sharp watch on your Box plants as it can break out at short notice. Topbuxus Health Mix is also a preventative to Blight and will help to revive sickly looking plants. Is there a customer services number I could call as I have several questions. Please let me have your telephone number so I can pass it on to someone who’s interested in your products but is not online. Keren, an ‘overdose’ of Topbuxus Healthmix will not damage your plants so by all means spray them again as the rain is very likely to have washed most of it off. Tracey, there are varying opinions as to your question. From our experience, we would suggest you leave the infected leaves where they are but to ensure that they have been carefully sprayed. Many thanks for your email, I have ordered some of the tablets. Will this work as a fungicide to get rid of the blight? Neil, Topbuxus has been designed to protect Buxus against Blight and our customers have found it very effective, even bringing plants back that have virtually defoliated. The link below will take you to customer reviews. Just received my order – many thanks. I believe we have a slight case of blight but just had a couple questions. Would it be best for me to clip the Buxus and remove as much as possible of the affected leaves or should I leave them and then spray so that the affected areas gets more coverage? Many thanks and looks forward to hearing from you. Mike, Unless the disease is very advanced and you are sure the actual stems of the plant are dead I would suggest that you do not clip out the infected areas. It would be more advantageous to treat the plant and wait until you have visible signs of regrowth (sometimes they will re-foliate from completely bare branches) then you can clip out the sections that are obviously dead allowing new shoots to fill in the gaps. Can I use this product on Hollies that have dropped a fair few leaves? 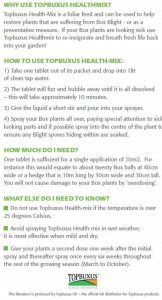 Graham, As Topbuxus Healthmix is a foliar feed I feel it is almost bound to help the plant to a certain extent. However, we haven’t used it on Hollies ourselves so we can’t advise from experience. If there is a lot of leaf loss it sounds like it may be a matter of too much or not enough water, that is generally what causes defoliation.